Married (1) Walter Anthony Burke (1904-1980) on 31 August 1931 in Tuxedo Park, New York. Divorced 13 November 1933 in Reno, Nevada. Married (2) Charles Edmund Voorhees (1909-1992) on 14 June 1941 in New York City, New York. 3 times a grand slam doubles finalist-failing to take the last step and garner a slam. 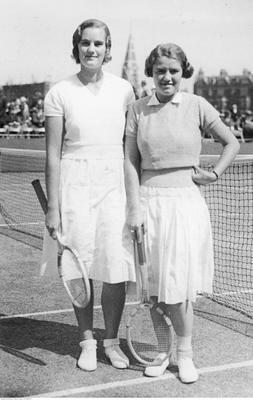 1934 Wimbledon doubles finalist with Sylvia Henrotin, also SF in 1936, 1937, and 1938. 1934 US doubles finalist with Carolin Babcock, also SF in 1932 and 1939. 1934 US Nationals singles semifinalist. According to the New York Times she inherited “a fortune” (estimated at 1 million dollars) on turning 21 on June 14, 1929. Her father was William L Andrus. Her grandfather John Emery Andrus was known as “the millionaire straphanger of Yonkers" and was briefly a member of the US congress. "Let the money wait. I can get my million any time." --Dorothy Andrus on not running to sign papers for her inheritance. She was busy playing a tennis tournament. She attended Smith College in 1931, but did not graduate. This was her first real year as a notable player, winning the prestigious Longwood event by upsetting Sarah Palfrey. This win moved her from #22 in the US in 1930 to #10 for 1931. Much was made of her marital history with Walter Anthony Burke. Burke was a wealthy Yale graduate. The pair eloped in August of 1931 at Tuxedo Park, two other public ceremonies in Stamford and Midleton were held later in the fall. Only the October 30 1931 ceremony was announced to the public. The three separate ceremonies are mentioned in her divorce suit on November 13 1933. As was usual for that time she obtained the divorce in Reno, Nevada. Her marriage was effectively over by the time she played the Riviera in early 1934, where she asked to be called Andrus rather than Mrs Burke. Divorce didn't prevent good tennis results-to the contrary 1934 was her best year ever. Dorothy reached the doubles finals at Wimbledon and the US Nationals. Sarah Palfrey proved to be Dorothy's nemesis that year, stopping her in both the US Nationals in singles and doubles. In the summer Andrus won the Maidstone title, a big event. At the US Nationals Andrus upheld her seeding to reach the semifinals. At that stage Sarah Palfrey pounced on her weak serve to win 6-3 6-4. Andrus was ahead in the 2nd set but fell apart after missing an easy overhead that would have given her a 4-1 lead. The next day Andrus and Carolin Babcock lost a close doubles final to Helen Jacobs and Sarah Palfrey. The 4-6 6-3 6-4 defeat was the closest she would ever come to a slam crown. Andrus ended the year #4 in the US. This was by far her highest singles rank. Her last opportunity for a major was in 1937. Dorothy and Sylvia got to the French final, losing to Simone Mathieu and Billie Yorke 3-6 6-2 6-2. The New York Times reported they "virtually beat themselves through errors." In 1937 she shared the Essex singles title with friend and doubles partner Sylvia Andrus after rain washed out the final. 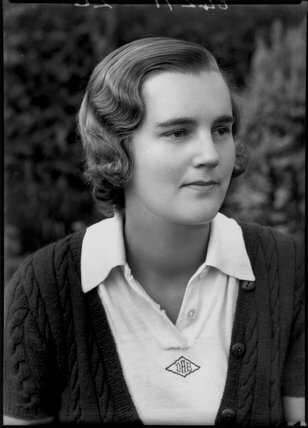 Among her numerous doubles titles with Sylvia Henrotin were the US Indoors and Bermuda (1935); Bermuda, St. George's Hill, London Grass and Maidstone (1936); Bermuda, Maidstone and Essex (1937); Bermuda (1938); London Grass (1939); and Pennsylvania and Eastern States and Hot Springs in 1940. She also won Maidstone in 1934 with Babcock and Seabright in 1937 with Jedrzejowska. Most effective in doubles, especially her partnership with Frenchwoman Sylvia Henrotin from 1934 to 1940. Andrus provided power with solid net skills,while Henrotin had devastating volleys and lefty guile. Easily among the top five doubles teams of their day, Andrus and Henrotin usually came up short against the likes of Alice Marble and Sarah Palfrey-the later team having more power in serves and overheads. In the late 1930s Mrs Andrus (as she was styled after her divorce) also entered some golf tournaments. She also played hockey. Dorothy had two sons by her 2nd marriage in 1941 to Charles Voorhees. Marriage and motherhood effectively ended her tournament tennis days. John Andrus Voorhees, b. May 31, 1943. Charles William Voorhees, b. December 19, 1944. Andrus had a good net game and a forehand that packed some punch. A weak serve and lack of consistency off the ground kept her from moving up the ranks in singles, where she was more a top 20 player at best. Andrus was always top ten in world class in doubles, using an assortment "heady volleys and lobs." Unusually for the 1930s Andrus competed overseas in Europe every year from 1931 to 1939 and at Wimbledon from 1932-1939. The New York Times was consulted extensively. Last edited by Rollo; Jul 16th, 2017 at 12:00 AM.